A massive search has been underway for the last few days, since the mysterious disappearance of James (Jay) Ott, 31, a New York clothing designer. 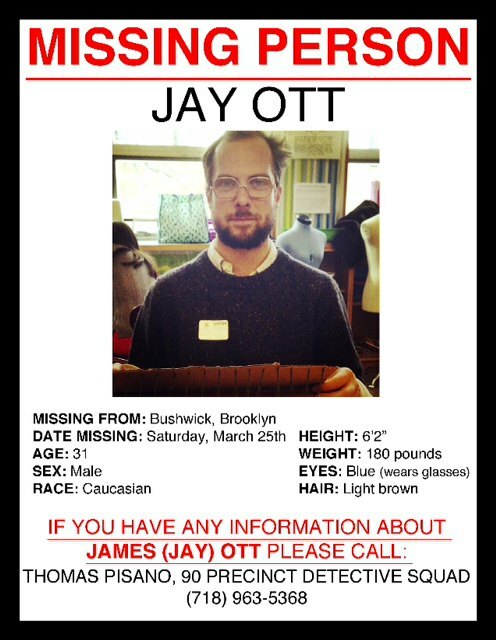 Ott was last seen Saturday evening at his McKibbin Loft residence in Bushwick. Since Tuesday, friends began papering Brooklyn and Lower Manhattan with missing posters, hoping that anyone with information will come forward. Ott is a fashion designer for Mary Kate and Ashley Olsen's label, The Row, and his disappearance has sparked a fervent search and appeal through major fashion media outlets such as Women's Wear Daily and Fashionista, as well as national news sites like Huffington Post and People.com. Friends have also launched a Facebook group, "Find Jay Ott," where anyone can post new information about Ott's whereabouts. According to the NYPD, he was last seen wearing a black sweatshirt, gray pants, yellow scarf, a navy blue knit cap, white sneakers and gold-rimmed glasses; his friends say they cannot confirm this is what he was wearing. A police source said the 6-foot-2, 175-pound Ott suffers from anxiety, but it was not clear if the condition had anything to do with his disappearance. If you have any information or tips regarding Ott's disappearance, please call 718.963.5368 for the 90th Police Precinct in Brooklyn or our "friends of Jay" number at 718.710.7919.